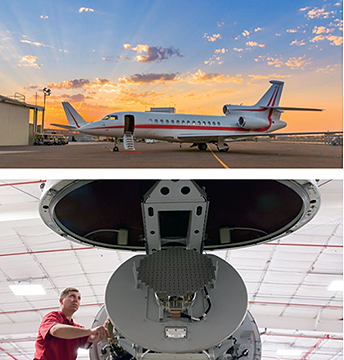 Viasat Inc. (NASDAQ: VSAT) and Honeywell announced now have an expanded agreement where Honeywell, as part of that firm's GoDirect™ Cabin Connectivity suite of services, will offer Viasat’s high-speed Ka-band in-flight internet service to large and mid-cabin business jet customers. Viasat’s Ka-band service is proven to support more passengers and more devices simultaneously through all phases of flight, when performing bandwidth-intensive applications, including accessing virtual private networks, or streaming high-definition (HD) video calls, cloud content or live TV entertainment. Conduct business or experience entertainment at 40,000 feet, as they do on the ground. The capacity offered through Viasat’s Ka-band network enables all passengers onboard to efficiently conduct business, or enjoy cloud-based entertainment—at any altitude and at faster speeds with the industry’s current fastest speeds offered on all plans, regardless of data allowance. Watch live streaming TV with minimal-to-no impact on the data plan. Business jet owners and their passengers will be able to view live TV news and sports with an additional subscription without impact to the data plan or the need for a separate antenna. Have high-speed in-flight internet virtually anywhere. For business jet travelers interested in the best global primary and backup connectivity service, Viasat’s Ku-band service, available via GoDirect, includes global Ku-band data on all Ka-band plans 40 GB and larger–at no additional service cost. This high-value service will be available for aircraft properly equipped with Viasat’s dual-band, Ka-/Ku-band shipset. According to the company, Viasat’s business aviation in-flight internet service will tap into the industry’s highest-capacity, most reliable Ka-band satellite communications network and will also use Viasat’s most robust business-class shipset, the Global Aero Terminal 5510. GoDirect will offer the Viasat Ka-band and dual-band service to new Viasat customers, as well as their current Viasat Ku-band customers interested in migrating to or adding Viasat Ka-band service. Certified units of the Viasat Ka-band shipset will be available for several business jet airframes in the second half of 2018. Jerry Goodwin, VP Global Network Services, Viasat, noted that by expanding the company's partnership with GoDirect, a new internet service quality is being brought to the business aviation market, enabling more business jet owners to be productive and access the applications they need and want in densely populated airspace, at the speeds and reliability they expect.